About three months ago a good friend asked if I would make their wedding cake. 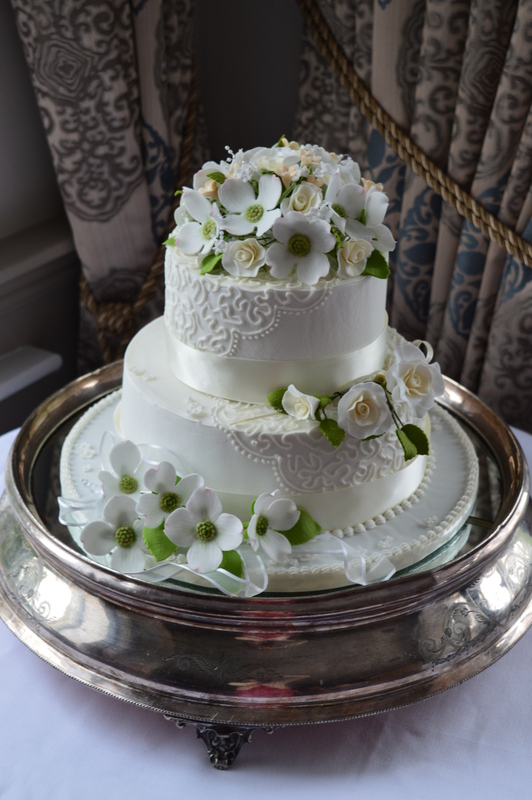 Having checked that they were happy with a rich fruit cake, I was delighted to accept, I’ve made quite a few celebration cakes, but only one other wedding cake which was my own. Rich fruit cakes are made well in advance, so it’s not as stressful as the last minute decorating required with a sponge cake. Then she dropped the bombshell…can we have it royal iced as we don’t like fondant icing…I explained that I had never flat iced a cake before in my life, she reassured me that it would be fine…somehow it’s not always reassuring when neither of you have done it before…I watched it on u-tube, it didn’t look too difficult!!!! I made the fruit cakes about three months ago to give them time to mature. I’d opted for a 9″ and a 6″ cake, rather than one big cake (it was a small, select wedding) as I didn’t want the responsibility of ensuring a 12″ cake was cooked in the middle! We had a long chat about the design as Kathy wanted to incorporate the American, UK theme into the cake. I didn’t fancy flags, my speciality is sugar paste flowers, I love making them and usually hope that if people are wowed by the flowers, they won’t notice imperfections on the cake!! I suggested combining the state flower of North Carolina, which is the dogwood, with the white rose of Yorkshire. She was delighted with the plan. 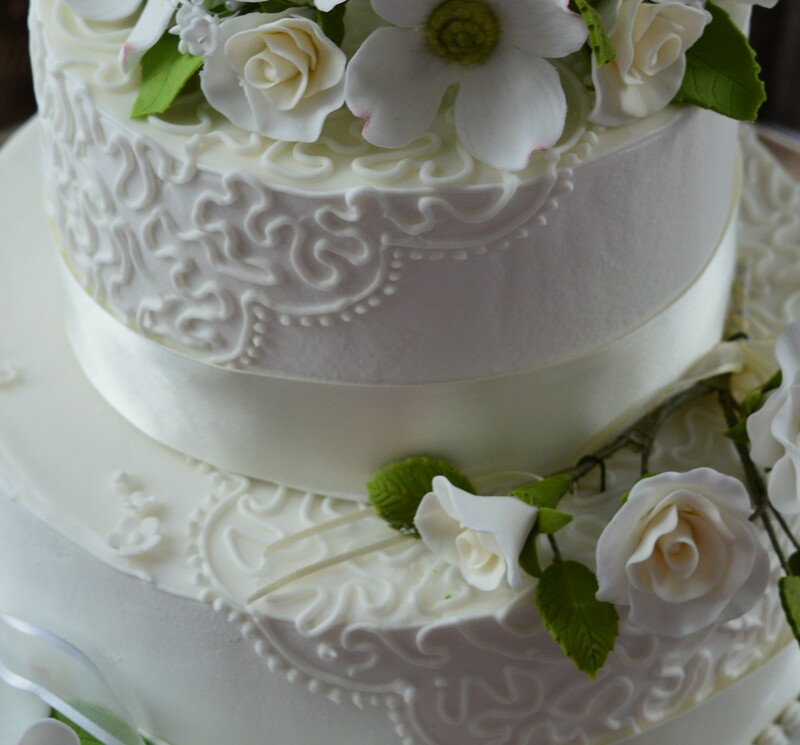 I found a design in a magazine which I felt would work with my skill level, it looked like a lace cloth with a scalloped edge was draped over half the cake, it was just piped with filigree so it would be fairly easy to do and could cover a multitude of sins!! All I had to do was flat ice the cakes…I took advice from some of my Women’s Institute friends and bought some Meriwhite egg substitute. Although it sets hard, it doesn’t set like concrete like icing made from egg whites can. Then came the tricky bit, applying it to the cake…they make it look so easy on U-tube…the sides had to be done on a separate evening to the top, three coats in total. The first coat was a general coating so I didn’t worry too much about it not being perfect. I made the icing for the second coat a little softer which did make it easier to work but it was still rather ‘ridged’ round the sides. I sanded the sides which did help and arranged back-up from a WI friend if my 3rd coat wasn’t good enough! When it came to the third coat I decided to be more realistic, I needed an area of about 1/3rd of the cake side to be good as the other 2/3rds would be covered in the filigree pattern. There was also to be a ribbon round the bottom, so I could concentrate on the upper edge! On about the third attempt I got a finish I was happy with! The tops of the cake were covered with a ‘float’ which is where a line is piped round the edge of the cake and soft icing is then poured on, eased to the line and left to dry. I was finally happy with the flat icing! After the stress of flat icing the rest of the cake was easy! 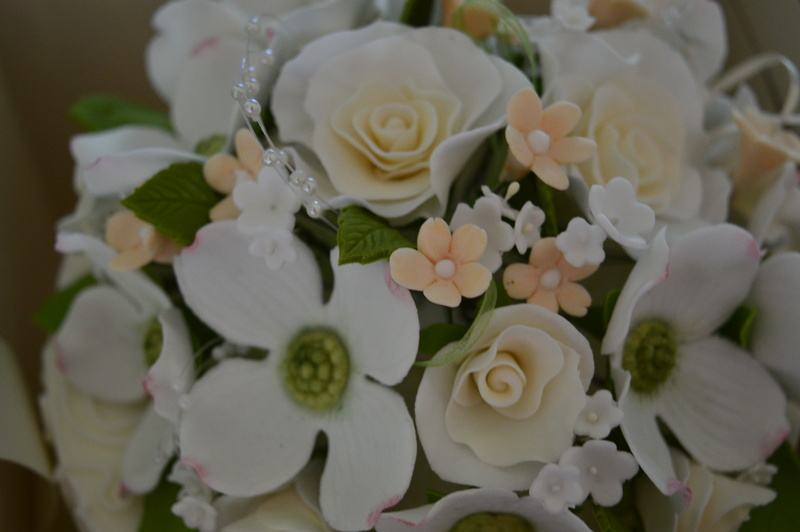 The flowers are made with flower paste, I bought a cutter to make dogwood flowers, it included a veiner and a mould for the centre of the flower, as well as cutters for the petals and the calyx. I made about 15 white flowers with a touch of pink on the edge of each petal. I made a similar number of ivory roses, lots of leaves and some white and peach ‘filler’ flowers. The flowers looked lovely and delicate. 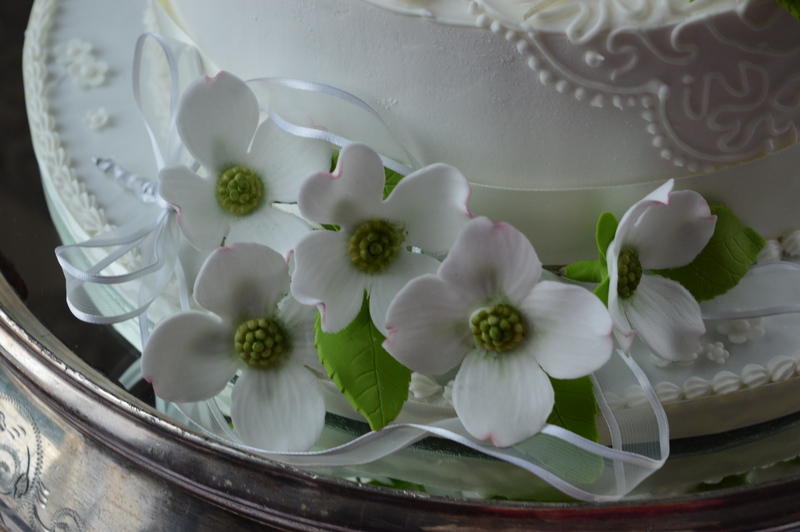 The plan was to have dogwood flowers around the base of the larger cake, white roses round the smaller one with both flowers on the top. I teased Kathy that although the American cake may be bigger , the Yorkshire cake was on top!!! The filigree pattern on the sides and top went really well and surprisingly quickly. 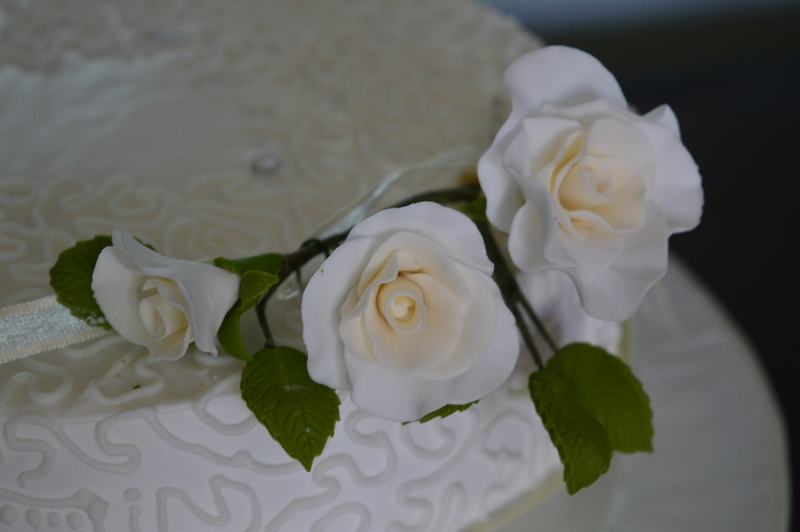 I measured the not so perfect lower edges of the cake and bought 1 1/2″ ribbon to cover it! The cake was coming together! I arranged the flowers for the top of the cake, using the filler flowers and leaves, together with ribbons and pearl loops to fill the gaps. I then tied a buttonhole type arrangement of roses and covered the stems with a ribbon bow which sat on the first tier. 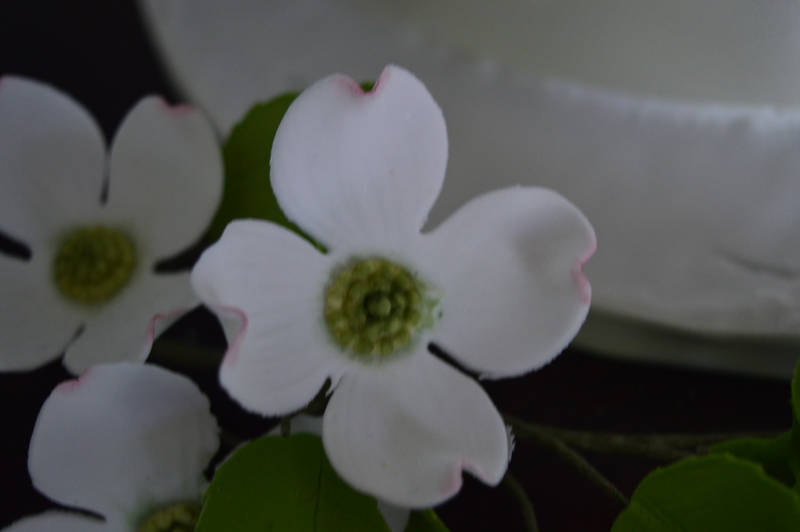 I made a similar arrangement of dogwood flowers to sit around the base. there were a few marks and imperfections on the base and the first tier so I sprinkled tiny filler flowers over the area. I was really pleased with the finished cake, it looked very elegant. There is a tendency to see all the mistakes in your own work, particularly as we do tend to strive for perfection. Sometimes we do just have to stand back and be wowed by the flowers…it tasted good too! 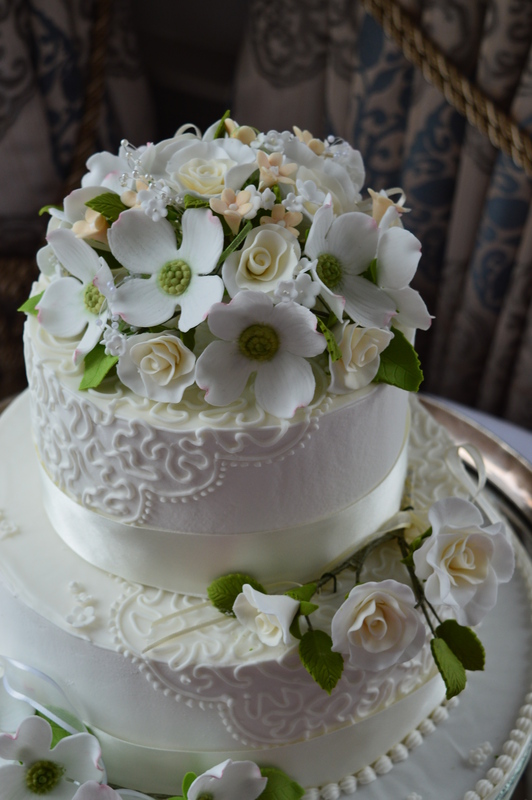 This entry was posted in Serendipity and tagged dogwood flowers, Roses, sugarpaste flowers, Two tier wedding cake. Bookmark the permalink. Hi, sorry I’ve been so long in replying, for some reason your comment was in the spam folder! Gum paste is probably the same, you can roll it thin enough to see through and it dries really hard.I’ve just learnt the sugarpaste flowers through books, they’re actually not difficult, just time consuming.. Glad you liked my blog, hope you visit again soon. your cake was beautiful tasted good too!